Sequential art narratives are images structured into a sequence to tell a story. Carter (2009) outlines the transition of sequential art, from cave paintings to comic books to the graphic novel. The first comic book was published in 1938, and children very quickly began collecting and exchanging them. Unfortunately, by the 1960’s, a combination of criticism and the advent of the television left comic books by the wayside (Monnin, 2010). In the 1970s, comic artists responded to societal assumptions that comics were immature and created graphic novels to prove the opposite. Chun (2009) defines graphic novels as original, book-length fiction or non-fiction stories, with mature themes and complex narratives, published in a comic book style. Graphic novels provide a reading experience with simultaneous images and text, as if the reader is both reading and watching a movie simultaneously. Jim Steranko created Red Tide and Will Eisner wrote and illustrated A Contract with God in 1978. Since these were first published, graphic novels have garnered critical acclaim; Art Spiegelman’s graphic novel, Maus II, won the Pulitzer Prize in 1992 and Gene Luen’s American Born Chinese won the Michael L. Printz Award in 2007 (Monnin, 2010). In more recent years, graphic novels have inspired countless films and television shows. Today, society is dominated by the visual image, and transmedia is becoming more prominent. Television, films, magazines, and the Internet are using images to communicate, entertain, and profit (Gillenwater, 2009). Graphic novels have impacted the images we view daily. Movies such as Batman, Spider-Man, Scott Pilgrim vs. the World, and Iron Man are all based on graphic novels (Behler, 2006). Television shows, such as The Walking Dead, Smallville, and The Human Target are based on graphic novels. Outside of Language Arts, graphic novels are powerful tool for teaching history (Monnin, 2010). Chun (2009) articulates the value of historically-based graphic novels, such as Maus, for their ability to communicate historical content in an engaging and meaningful way. He argues that students “can mediate these historical realities with their unique visual narrative styles that allow many readers, especially adolescent ones, to imagine and interpret characters’ experiences that are far removed from their own daily lives” (p.. 146). 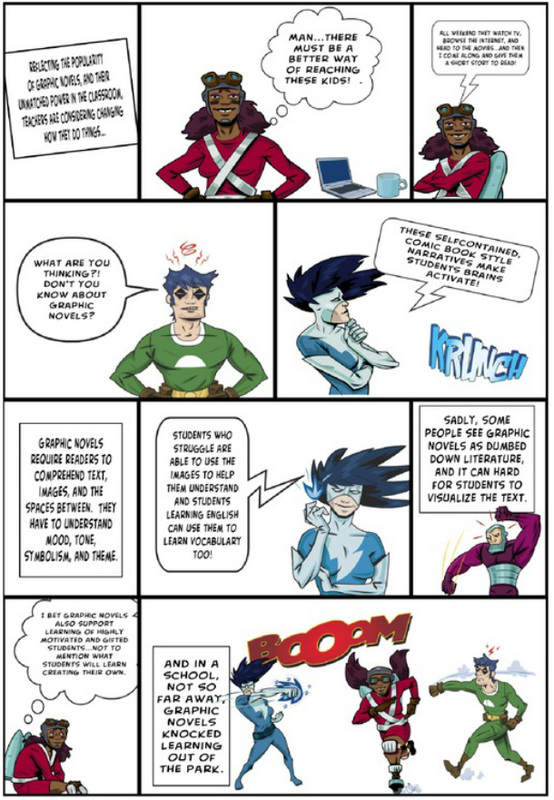 Graphic novels have received attention for their ability to motivate reluctant readers and support multiliteracies. However, graphic novels are not only for readers who struggle. Carter (2009) summarizes the research of Mitchell and George (1996), who found that sequential art benefits already motivated readers and supports the examination of ethical issues with gifted students. McTaggert (2008) reminds educators that they need to teach graphic novels because “they enable the struggling reader, motivate the reluctant one, and challenge the high-level learner” (p. 32). In addition, graphic novels improve reading comprehension while complimenting the other core curriculum areas (McTaggert, 2008). Behler, A. (2006). Getting started with graphic novels: A guide for the beginner. Reference & User Services Quarterly, 46(2), 16-21. Carter, J. B. (2008). Comics, the Canon, and the Classroom. In N. Frey, & D. Fisher (Eds. ), Teaching visual literacy: Using comic books, graphic novels, anime, cartoons, and more to develop comprehension and thinking skills (pp. 47-60). Thousand Oaks, CA: Corwin Press. Carter, J. B. (2007). Transforming English with Graphic Novels: Moving toward Our "Optimus Prime". The English Journal, 97(2), 49-53. Hughes, J. M., King, A., Perkins, P., & Fuke, V. (2011). Adolescents and "Autobiographies": Reading and Writing Coming-of-Age Graphic Novels. Journal of Adolescent & Adult LIteracy, 54(8), 601-612. Kluth, P. (2008). "It Was Always the Pictures...". In N. Frey, & D. Fisher (Eds. ), Teaching visual literacy: Using comic books, graphic novels, anime, cartoons, and more to develop comprehension and thinking skills (pp. 169-188). Thousand Oaks, CA: Corwin Press. Moeller, R. A. (2011). "Aren't These Boy Books? ": High School Students' Reading of Gender in Graphic Novels. Journal of Adolescent & Adult Literacy, 54(7), 476-484.